Working with Development, Design and Estimating to prepare a project for success. Manage buyout, schedule and onsite supervision for a timely completion and overall profitability of projects. Work with a team to help coach, lead and train others for future success. Bob and his wife, Julie, have been married for 31 years, and they have two daughters and a son. He enjoys traveling, playing golf, and spending time with family and friends. He is a serious sports nut, attending football, basketball and baseball games when he can. Bob is also a big IndyCar fan and his southern Indiana roots makes him an avid follower of horse racing. Bob has a multitude of experience in multifamily, commercial, retail and a variety of fast food and casual dining builds. 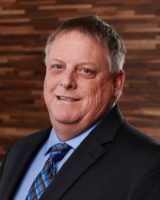 Known as results-oriented, Bob is a hands-on construction/development professional with numerous projects completed throughout the Midwest, Southeast and Texas.